World in Motion: My favorite actor? Kevin Bacon obviously. My favorite actor? Kevin Bacon obviously. Monday. You know what that means right? It means a fresh start to all things new. For me at least, it means another week at finding myself a permanent job. I've been on so many interviews by this point that I could call myself a professional interviewer. At least those skills have improved! Don't get me wrong, internships are nice, but something permanent would put the mind at ease. Fingers crossed! I had a pretty productive weekend. I ran in the Santa Shuffle 5K and actually placed 2nd in my age group! Apparently I would have gotten an award, but I left too early to find out! All is good though because the people at Potomac River Running told me they would send me the award. Besides that, I took this weekend as an opportunity to get most of my Christmas shopping done. A few more gifts here and there and I should be done. Anyways that's enough about me! Today I bring to you a commercial for Logitech/Google TV. 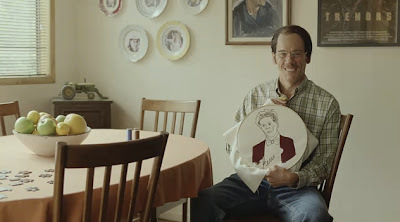 The spot features Kevin Bacon, I mean, just one die hard Kevin Bacon fan. The first time I saw this was over the weekend, and instantly found it hilarious. I like the play on using the Logitech keyboard with the Google TV set up. I didn't realize you could just do instant searches like that and have items on the web just pop up, for instance a video on Kevin Bacon. Anyhow, check it out, and let me know what you thought! Enjoy!